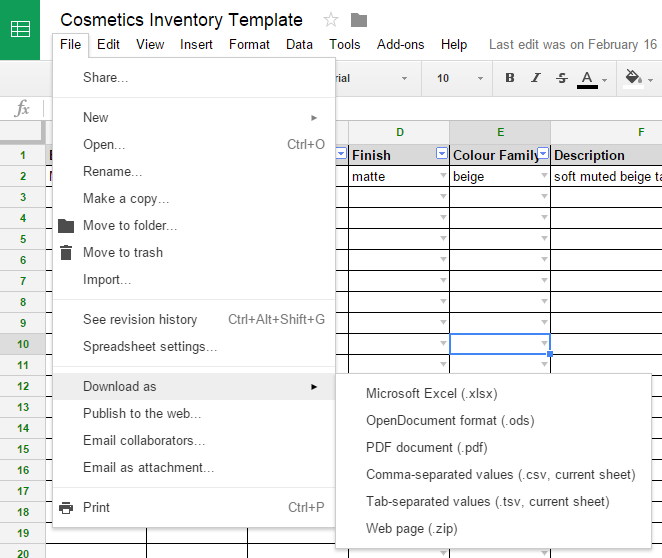 There’s curiosity about my cosmetics inventory spreadsheet so I thought I would devote an entry on how it came to be. I created my cosmetics spreadsheet on Sunday July 26, 2009 (as revealed by the Excel file properties). At the time, it was primarily a way to track my growing nail polish collection so that I didn’t duplicate any of my Essie shades (at present count, I own 73 bottles of Essies – it is my favourite nail polish formula). The initial set up of the spreadsheet was a daunting task. If I had created the spreadsheet from the inception of my first beauty product purchase, it would have been a breeze. But I had to essentially do a full inventory of my stash to build the spreadsheet – item by item, line by line. It’s nothing revolutionary, it’s just a database to store information including the brand, item name, official colour name, date item was acquired, weight or volume of product. I like to write notes on what store I bought the item, what collection it’s from, or some comments about its performance so it’s easy to refer to later on. In addition to tracking products I currently own, I also use the spreadsheet to track products I have owned and finished or purged, as well as a wishlist – the “Status” column on the right hand side is as follows: o = own, g = gone, f = future purchase (aka wishlist). I also colour code the lines for easy at-a-glance differentiation. I like to track skincare items that I’ve tried and used up, and write comments about the active ingredients and how I liked the product. Sometimes I repurchase old forgotten favourites this way. A snippet of my red nail polishes. Apparently I own 43 red nail polishes. Go to File, then “Download as” to save it onto your computer, save it as Microsoft Excel. Edit: I’ve added a tab in the file called “READ ME” which details 2 ways to save a copy of this template so you can edit it. It has some presets for colour family and finishes to help build your cosmetics inventory. If you don’t own Excel, you can always use either Google Docs or OpenOffice Calc (it’s free and works really well). Let me know if you do decide to use it! I hope you get a chance to use it! It’s a good way to keep organized! Will definitely be doing this! So helpful and what a good way to keep track of all your skincare and cosmetic products! Thank you so much for sharing your spreadsheet! Exactly what I was looking for! You’re using the same mascara for FOUR years?!! Oh my gosh. 😱 Please please I beg of you, throw it out immediately! And I hope you’ll find this spreadsheet useful! O man, I really think it will be epic to travel together. I will end up following all your xls plans because I’ll have none. I started one in google sheets haha but was too lazy to actually catalog everything. Definitely going to download! Why reinvent the wheel? 😉 Hope you’re finding it useful. I really appreciate that you shared this! I was thinking about how to keep track of lipsticks I own, and I’ve been really into spreadsheets lately. This just clicked. I love the set up.